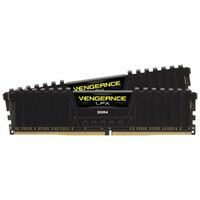 VENGEANCE LPX memory is designed for high-performance overclocking. The heatspreader is made of pure aluminum for faster heat dissipation, and the eight-layer PCB helps manage heat and provides superior overclocking headroom. Works with Intel and AMD. Recommended for AMD Ryzen & Threadripper. Built with Samsung B die.